When the Factory No. 183 design bureau under Aleksandr Morozov began to look at follow-on tanks to the T-34, they eventually came up with the design of the T-44 medium tank. More compact and better armored than the T-34-85 it was supposed to replace, it offered a hard hitting tank for the Red Army. When Kharkov was retaken in 1944 and the old Factory No. 183 grounds restored to minimum operational condition, the T-44 was the first tank to enter production there in November 1944. Over the next two years about 1,800 of these tanks were built before work switched over to the next tank, the T-54 mounting a 100mm gun. The T-44 tanks had some problems with overheating and other glitches from the new transverse engine design, and as a result were mostly regulated to training. Their only “combat” use was when a small number of them took part in suppressing the Hungarian uprising in 1956. The T-44M started its life cycle in 1961 as the vehicles were refitted with new components from the more successful (and widely used) T-54 series tanks. These include a new engine (V-54) and transmission, new electrical components, new radios and intercoms, and new tracks and drive wheels (tanks with worn out road wheels had them replaced with the same “starfish” style wheels fitted to the T-34-85 Model 1960 rebuilds). The driver-mechanic received a TVN-2 night driving viewer, the commander got a TPKUB viewer, and other parts were upgraded. But the tank retained its ZIS-S-53 Model 1944 85mm gun and two DTM machine guns, one coaxial and a fixed one for use by the driver-mechanic. The line T-44M now used an R-113 VHF FM radio and R-120 intercom, and the K models (T-44MK) also received an R-112 HF AM radio and erectable mast for use at fixed positions. The chassis was also used for the BTS-4 tank retriever. These tanks wound up being the “school” tanks of choice up until 1997 when President Yeltsin ordered them taken out of service and scrapped. However, there is no information how many remained in service by that time. 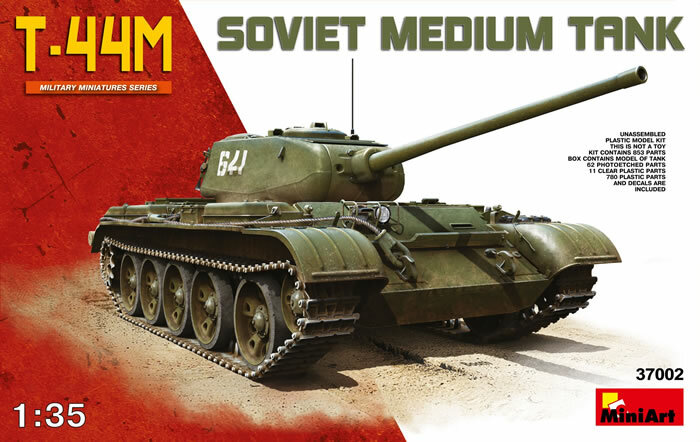 In short order Miniart has come out with first a T-44 kit and now this T-44M version. Both come in large boxes packed to the gills with parts and sprues (this kit has 85 to be exact!) and a fret of etched brass. All are cleanly molded and with many very petite parts. The directions come, like many Miniart kits, as a nice booklet with clear drawings. The engine uses both parts from the T-44 kit and a new sprue with a different crankcase and mounts, so pay close attention to the instructions. The parts colors are flagged all over the instructions and can be a bit distracting if you are not careful. In Step 9 the hull begins construction with the torsion bar mounts and road wheel arms. Unlike any other kit I have ever built, these assemblies are put together and then cemented into the belly pan of the vehicle. These are followed by the forward ammo stowage, the floor and the engine assembly and air cleaner. Note that there is no “guitara”, transmission or radiator provided in the kit; Miniart figures that modelers will not need to open the entire engine deck to view the engine and therefore those assemblies will not be seen. Step 13 begins assembly of the hull proper and the sides consist of both inner and other walls. Most intricate and time consuming sections here are the two DTM drum towers which consist of plastic bases and drums and 11 etched brass racks each and a plastic tie-down strap. 40 85mm rounds are provided and most of them find homes inside the hull and turret. In Step 20 you will have to decide if you want to show the engine and air cleaner or not; if so the hatches will need to be left loose. In Step 21 the headlight array is assembled and it consists of at least 11 parts. Step 22 covers the engine deck grilles and note that you should be able to open the louvers (B4) for cooling but I am not sure if Miniart left sufficient space for them to be cracked open. As the louvers are provided, you would not be able to see the radiator through the PE mesh grilles anyway. The same is true of the engine radiator air exhaust grilles (Ga2-PE3) but the fan and oil cooler would be located under them (fan to the right, oil cooler to the left). When the tracks are installed, the directions indicate you can use 90 links with teeth or 72 with teeth and 18 plain links per run. I have no clue if this is correct or not but I would stick with the 90 toothed ones. If you want to show off that interior, I suggest you do not cement the roof and turret race section (B20) in place in Step 34. The turret of this model is quite detailed but quite complex, and the next steps cover the assembly of the gun and its coaxial DTM machine gun. The turret halves are asymmetric to ensure a smooth surface across the back; this is a smart idea as it is easier to fill and sand down a corner than a seam in the middle of the back of the turret. While some will grouse about a multi-part turret in a day and age of slide molding, it makes sense with all of the interior components that have to go into this turret. The gun barrel is slide molded with a hollow bore, so a few minutes with a Flex-i-File will have it ready for installation. The commander’s cupola consists of 20 parts with clear vision blocks and commander’s periscope. Like most Soviet/Russian armor kits, the unditching log is very smooth and will need to be roughed up with a razor saw and sandpaper to look right. Once done it slips into PE straps installed earlier in the build (Step 19) but you may wish to install it there to ensure it fits. Four finishing options are provided: unidentified school tank, Red Army 1960s-70s (protective green with yellow bort number 418); 193rd Tank Training Regiment, 24th “Iron” Tank Division, Dabele, Latvia 1974-76 (protective green, small white stars flanking bort number 655); unidentified school tank, Red Army 1960s-70s (protective green with ort number 541); Tank Training Regiment, “Kirov” Tank Command School, Leningrad Military District, 1970s (protective green with whitewash, bort number 554). A small sheet of decals is provided for these options. Overall this is a wonderful kit and they did change a number of parts from the T-44 kit such as the road wheels, tracks and fenders. But as most of the sprues are repeats it is not as intimidating as 85 sprues would make it sound!